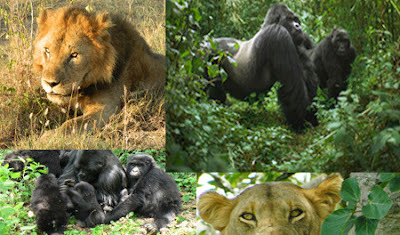 This is a fantastic Uganda Tour to Kibale Forest, Bigodi swamps, Queen Elizabeth, Ishasha sector and Bwindi National Parks for game viewing, chimpanzee tracking,cultural trips, gorilla trekking, boat cruise, tree climbing and bird watching. We drive westwards towards Fort Portal to the Kibale Forest National Park (about 5 hours). Traveling on both asphalt and unpaved roads, you pass through traditional Ugandan Villages where you see people at work tending their traditional crops of millet, sorghum, beans and maize. The lush rolling hills of this region provide good photo opportunities. As you approach Fort Portal in the foothills of the Rwenzori Mountains, you enter Uganda's famous tea plantation region. A carpet of green spreads before you, as far as the eye can see, and seems an unusual contrast to the countryside through which you have just passed. You arrive at Fort Portal, then, continue toward Kibale Forest, one of the great African rainforest research reserves. Years of study by scientists (who have cut a grid through the forest) have habituated many of its animals to human observers. This forest is famed for the variety of primates found here and it is a terrific area for birds. You will surely enjoy these two days! After breakfast, proceed for the morning briefing before enjoying the highlight of the trip- Gorilla trekking, which may last the entire day. We trek through the rainforest and bamboo covered slopes, accompanied by a guide and trackers, in search of a mountain gorilla family. The walking can sometimes be tough and long, but when you catch a glimpse of the magnificent silverback, any discomforts will be quickly forgotten. When sighted, visitors will be guided to within 6 metres from the gorillas, sit around them for a whole hour while gazing into their big round eyes. Early breakfast before embarking on our return to Kampala, driving down the grassed and terraced escarpments of southwestern Uganda while taking in the breathtaking sights of the hills of the region dubbed ‘the little Switzerland of Africa’. This area is a highly fertile, mountainous region with steep sided hills covered from top to bottom in neatly terraced cultivated rows. Not to miss as we traverse Mbarara are the impressing long horn Ankole cattle. A remarkable highlight of this journey is the Equator line and surely you will cross it as we have a brief stop here. We will be in Kampala in the evening before for your flight back home. Included : Complementary arrival and departure airport transfers, gorilla trek permits, chimps tracking permit, other game viewing permits, meals indicated on programme, drinking water, experienced driver/guide, accommodation as per programme, park fees for the various parks, transport on tour as well as hotel transfers, entrance fees for tours mentioned in the programme, boat rides as on the program, Equator.